LARGE (20-LITER, 0.9 CU.FT.) CAVITY FITS 12" PIZZA: The interior is large enough to cook an entire 12" pizza, bake an entree or side dish. Make a meal for the whole family right on your countertop. LARGE 6-SLICE TOAST CAPACITY: Lets you make toast, bagels or English muffins. The toast color selector with automatic shut-off allows you to choose settings from light to dark for toast just the way you like it. ROTISSERIE SPIT: It's easy to detach, load and clean. It is used in conjunction with a bake pan for convenient cleaning. MULTIPLE COOKING FUNCTIONS: This is the ideal multi-functional family oven. 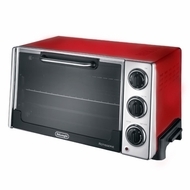 Choose BAKE, BROIL, TOAST, SLOW BAKE, ROTISSERIE or KEEP WARM for precise and convenient cooking. ACCESSORIES INCLUDED: Non-stick pan, non-stick broil tray and 1 flat rack. NON-STICK INTERIOR: Makes cleanup quick and effortless.